The end of October is upon us. You know what that means, don’t you? I was going to put today’s Big Question off until the end of November, but that doesn’t give me a lot of time to start planning for next year. During these last two months of the year, I’ll be working on future plans for Needle ‘n Thread. To do that and do it well, I need your help! What do YOU want from Needle ‘n Thread? It’s easy to say what my plans are for next year: to improve upon this year. And as always, my plan is to make Needle ‘n Thread the best it can be. But, just like any endeavor that continues from year to year, Needle ‘n Thread needs some fine-tuning and some direction. And you can help me with that! How? By taking a survey. It’s a 20-question survey, completely anonymous, with no personal information (email addresses or anything!) collected. I just need your answers to 20 questions about needlework and Needle ‘n Thread. The questions will help me to know you better, and to know what you want. The survey will take about 10 minutes (or less) of your time. And by helping me out, you’ll also be helping yourself. 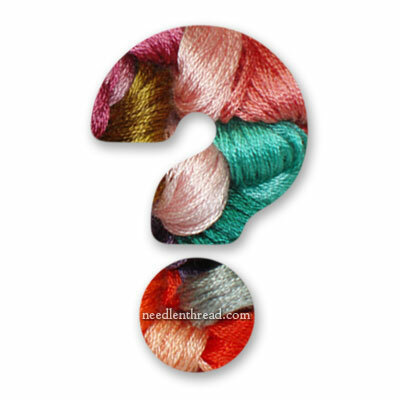 This is your opportunity to influence the content you find on Needle ‘n Thread, to tell me what you like and what you don’t like, what you’d like to see more of (or less of! ), and how you use Needle ‘n Thread in general. If you can spare me just a little bit of your time to take the survey either today or perhaps this weekend, I would greatly appreciate your feedback! Click here to take the survey to help decide the future direction of Needle ‘n Thread. Thank you, Sarah! I’m glad you like my …. ummmmmmm…. sense of humor. Sometimes, I wonder about it. I wonder if people get it. Kind of like the quote from Kermit the Frog above. I don’t even know why I typed that, and yet, there it is. I did catch that quote up there 🙂 I’ve always liked Kermit the Frog; I did watch Sesame Street every morning for years up until I was about, hmm, seven or eight, maybe? Probably eight. Usually it’s the little things that make me smile, or even laugh. Your clever puns (Noodles and Thread, It’s a Crewel, Crewel World), quotes that are just right for the situation (Time’s fun when you’re having flies, riffemraffemfrickemfrackem). Sometimes, though, it’s things like what you said you’d do with yellow, when you decided to use yellow outlines for the leaves of the SGH project. “And now I’m off to buy a yellow car, paint my house yellow, paint my room yellow, buy a canary, and eat bananas and lemons until the end of my days”. (I found out from the comments that you hate bananas; I do too). I was unable to load the survey. Will try on a different computer later. But, just in case…the only thing I would like to see more of is pictures of your finished needlework projects. Other than that … Great site. I also had to change browser from Opera to Mozilla; wouldn’t load under Opera. Excellent idea, I hope you get a lot of responses. I got all the way to the last question then it went from 200 characters left to 0 characters left and froze up. Won’t let me delete or anything. And I was in the middle of correcting a previous sentence and hadn’t finished my last sentence lol. So you may get a somewhat jumbled looking answer. Good idea to do the survey, and I’ve sent it in already! I hope you plan on giving us updates on your results? I like very much that you’re open to hearing from your followers. If people want to hear the basic results, I’ll put something together…. I have to admit, some of the results are a little surprising! In a good way, of course – it’s always good to get feedback! I tried several times to take the survey, I either just get to the opening page or am able to answer the first question , hit next and a blank page appears. I am on my personal computer at home. Hi, Carol – sorry about that! Not sure what the glitch is – but I’ll let the survey provider know there are some problems. Thanks for letting me know! Ooh, the idea of a kitted class is very exciting. I know it would be an incredible amount of work for you, Mary, but I would totally pay for a class you led. Interesting exercise in logistics, though, with so many possibilities for course delivery. … and yes, please do share results. I’d like to learn more about “us” – what we like, etc. Hi, Laura – thanks! I’ve done it a few times here, and it’s worked out pretty well. We shall see what the future holds! Laura puts it just right: please let us know about ‘us’. Even though by far most of the readers and commenters don’t know eacht other or you, Needlenthread really feels like ‘us’. The survey doesn’t seem to run on my iPad. I’ll try on a laptop later. The only thing I would change about your blog which I love, is either reduce the number of posts on monograms or include more about actually embroidering them in the posts. They are the only entries I tend to skip past without reading. But that is a minor point and one I expect few others share. Same problem on my iPad. Goes to the first page but when I click “Begin” it goes to a blank page. Tried 3x. Yes, would also love to know the results later! Took the survey! I would like to know what the results are. Love getting the newsletter everyday. I took your survey and I have to say what I like most about your blog is that it is consistently there. I know every Monday – Friday you will have a bit of embroidery news for me. I admire your dedication! I, too, ran out of space on the last question. It was not because I wanted you to change anything but rather my answer was about all that I like about it. I was able to erase a word or two so that my last sentence made sense, but there was a lot more to be said. I hope you get my intent. Yes it does when you fun time having flies. I’ve completed the Survey great idea and as I said in the Survey I wouldn’t change anything on Needle ‘n Thread I love the site and you are so helpful in all aspects of hand embroidery and I enjoy our daily contact especially your sense of humour and the fun times you share with us which I really enjoy, so thanks for all your hard work and for thinking of us by asking for our contributions very generous of you. First off, I want you to know I really enjoy Needle N Thread! I would like to see some of the following: Sashiko embroidery, quilting, and Kantha. Thanks! I don’t do ’embroidery’, I cross stitch, but your blog I do read since some of the content is relevant (reviews on stands, needles, scissors, how to work certain stitches like french knots, lazy daisies etc). And as someone else stated, your posts are fun to read. One tutorial I’d like to see is how to anchor back stitching when the pattern requires you to do long stitching. I admit I’ve had to knot my back stitch strand to a cross stitch vertical bar on the back occasionally, since weaving the tail around didn’t anchor it enough, and I had to restart the back stitch section several times. Another tutorial I’d like to see is step by step how to turn your work into an object like a pillow, an ornament etc. The instructions in books I own usually end up very sketchy/non-existent in that regard. What type of interfacing to use, how to attach cording, how to frame it yourself etc. Also tried to take your survey,but alas no luck. Love “Needles ‘N Thread” and your videos. I give you credit for getting me interested in embroidery again. I’m presently working on a BOM embroidery project. I really enjoy BOM projects as they don’t seem as overwhelming to me, yet I know that I’ll have a bigger project finished at the end of the year. I filled in the survey and sent it by submitting it. Since then the ´wheeĺ on the screen stays turning and the survey does not seem to be willing to leave belgium for the us. Survey done! Hope my answers don’t skew things against videos – I had to answer that I don’t watch them – but that’s my computer, not your videos! I just did the survey too! Hope it helps. I love your blog and I think it is great that you enquire about what we like about it and about what we would like it to become. Ditto Sarah A.’s comments. Survey done! I too appreciate your sense of humour, but better yet, I appreciate that you’re not afraid to show us your boo-boos. Honestly, I find I learn as much from your mistakes that you forthcomingly show us as well as your journey in “getting it right”. And that is a rare gem indeed. I have taken the survey Mary. I would also like to know the result of it. There were a couple of places where I would have like to put more than one tick; but I made a comment where I could in that regard. I love reading you blog. When it’s in my in box if it’s something that I want to return to I keep it otherwise I delete it from my inbox but know I can always find it on the site. Done. Hope I didn’t say the wrong things and I got around the question of which aspect I like best by clicking Other and typing ‘everything’. That’s it in one word. Thank you so much for all that you do to improve the lives (and embroidery) of so many people. Your mastery of the subject, your humour, your humility, your humanity are fantastic and I love your blog the way it is. Thank you for the opportunity to help you out! You have inspired me to want to make beautiful embroidered masterpieces. But there is one difficulty. Where do I find the supplies? I live in Western Australia. I have asked the local Embroiderer’s Guild. They say that this is a good question, and suggest I try second hand stores for good quality linen pieces to use as ground fabric. We don’t know the history of these fabric pieces so there is a chance of unforeseen deterioration later on. Choosing fabric quality and colour on the internet is also difficult. Any information on where to source the best quality supplies is always most welcome. The problem is the same here. I bought a book from Country bumpkin ( your area of the world) and I hav e problems getting all the supply here in the Province of Québec, Canada. NEEDLE AND THREAD is all what I expect as an embroiderer!!!!!!!! I just took the survey. Thanks for letting our ideas count. First time commenting here – took the survey and want to thank you for this wonderful site! Discovered N ‘n T several weeks ago and have been devouring the content (great archives and love the tips/tech. lists)on an almost daily basis. LOVE everything you write, and your sense of humor is terrific – don’t change your style, please! Kitted class – YES!!! That would be great! Didn’t have enough room on survey to also beg for more ideas on practical ways to display/use embroidery – would really appreciate ideas for gift items, etc. Thank you, Mary! Survey taken, but with a heavy heart. How can you change/improve on something that is already perfect and leaves one fully satisfied at each visit? Congrats on your Threads magazine article (my home subscription copy arrived last night) on beetle wing embroidery! Survey accomplished too, though I totally love your website just as I’ve found it and bookmarked it for daily viewing. Took the survey and signed up for the daily newsletter! Two results already from your survey. I’ve subscribed to your newsletter – I’ve been concentrating so much on reading your wonderful blog that I’d missed seeing that tab – and a LOT more people have joined Stitchin Fingers. The second result shows just how much we all appreciate your generosity.